Today (8 March 2018) the Department for Transport announced that it will begin developing proposals to ensure that wheelchair users can access buses and that drivers can fulfil the duties given to them by the courts. "Passengers with disabilities must have the same opportunities to travel as other members of society, and it is essential that the services they rely on are accessible and work for them. "Where people live, shop, go out, or park their car should not be determined by their disability and accessible transport networks are vital if we are to support those with disabilities to live independent lives and fulfil their potential." "The committee welcomed the speed of the department’s response to the Supreme Court’s judgement on the use of wheelchair spaces. "Fighting for what is essential space should not be part of the day-to-day experience wheelchair users have when using buses. We hope the department will maintain its pace into the implementation phase, to ensure that wheelchair users no longer face these challenges or have to fight for facilities provided for them in law. Without a greater degree of certainty over the use of the space confidence in using public transport will be difficult to achieve. "The group considered the impact of the current situation on disabled passengers and the options available to address them, and we now need the jigsaw of interventions proposed to be put in place to make a meaningful difference for wheelchair users." In January 2017 the Supreme Court handed down its judgment in the case of Paulley vs FirstGroup PLC, concerning the “reasonable adjustments” which must be provided by bus operators to enable wheelchair users to access the on-board wheelchair space. 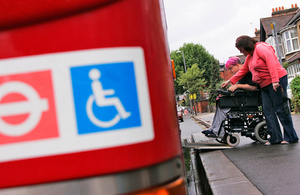 The Supreme Court judgment states that FirstGroup’s policy with regard to use of the wheelchair space was insufficient to meet the requirements of the Equality Act 2010, and that bus drivers should be required to do more than simply request that a person vacates the wheelchair space, including suspending the journey if needed.